You’re already using fans instead of air conditioning as much as possible, and you’ve hung up curtains to keep some of the direct sunlight out during the hottest parts of the day. But what else can you do to save money this summer when it comes to your utility bills? Here are some handy tricks you can use to cut back on your energy use and save more during the hottest months of the year. Running your dishwasher can actually put out quite a bit of heat into your home. In addition, it can contribute to higher humidity levels. Both of these things cause the air conditioning to work harder to cool your home. In the summer, you can save on energy use by cutting back on how often you run the dishwasher. Try washing dishes by hand most days, and only run the dishwasher when it’s completely full. This will help maintain a cooler, more comfortable temperature in your home and cut back on your energy use both for the dishwasher itself and for your AC. In the winter, line drying your clothes probably isn’t an option. 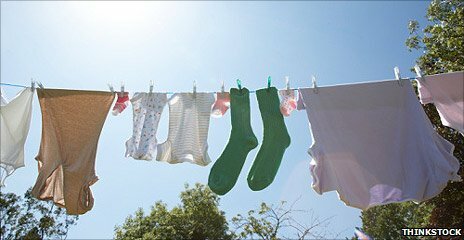 But now that the weather is sunny and warm, you can skip the dryer and simply hang your clothes out to dry. It’s much more environmentally friendly and will cut back on your energy use since you’re running this appliance less often. Like dishwashers, clothing dryers also emit more heat and humidity into your home, so by cutting back on your use of the dryer, you’ll also run your air conditioning less to get the home to a comfortable temperature. There’s an added bonus to air drying as well since it helps to keep your clothes in good condition for longer. If you go through your home right now, you might be shocked to discover just how many appliances and electronics are running in the background without being used. In addition to using energy just by being plugged in, many of these devices (like laptops, for example) continue to create heat even when not being used. Turn off and unplug appliances and electronics whenever you’re not using them in order to cool down your home and save on energy. It’s especially important to be aware of any appliances that are placed close to a thermostat. If certain devices or appliances are creating lots of heat near the thermostat, your air conditioning might run more often than necessary. Cooking outdoors is a favorite summer pastime, but you may not realize that it’s also a great way to save on your energy bills. By having barbecuing on your grill, the heat from cooking goes outside instead of getting trapped in your home, forcing your AC to work harder to keep the house cool. Give your kitchen appliances a break for dinner at least a couple times a week and cook outdoors instead. You can also brush up on some cold dishes that make for delicious dinners like fresh salads so when you do prep meals inside, it creates less heat in your kitchen. Colder weather and darker evenings often force us indoors earlier than we’d like. But in the summer, the warmer temperatures and extended daylight hours make it possible to enjoy the outdoors much later in the day. Instead of using air conditioning, appliances and electronics at home, you can spend more evenings outdoors just enjoying the beautiful weather. Pack a picnic, play at the park, work on your garden or go for a walk around your neighborhood. You’ll use less energy at home and save on your utility bills by taking advantage of the great outdoor conditions during this time of the year. Summer is a great time to work on your home’s landscaping. In addition to your vegetable or flower garden, consider what types of plants might contribute to lower energy usage in the future. For example, you could consider planting a large bush or tree in a part of the yard where it will block some of the direct sunlight streaming into your home. By increasing the shade, your home won’t get as warm and you won’t have to run the air conditioning as often to maintain a comfortable temperature inside. There are lots of ways to save money in the summer so you can spend on fun experiences with your loved ones or sock away cash for a rainy day. These tips will help you to cut back significantly on your energy use so you can see a decrease in your utility bills while also taking some eco-friendly steps that are good for the environment as well. Try incorporating these tips into your summer routine so you can spend less and enjoy the best parts of summer with your friends and family.